Trains of red coaches hauled by red engines have been a bit rare south of Kempten since the December 2007 timetable change when most of the services operated by DB Regio went over to DMUs. 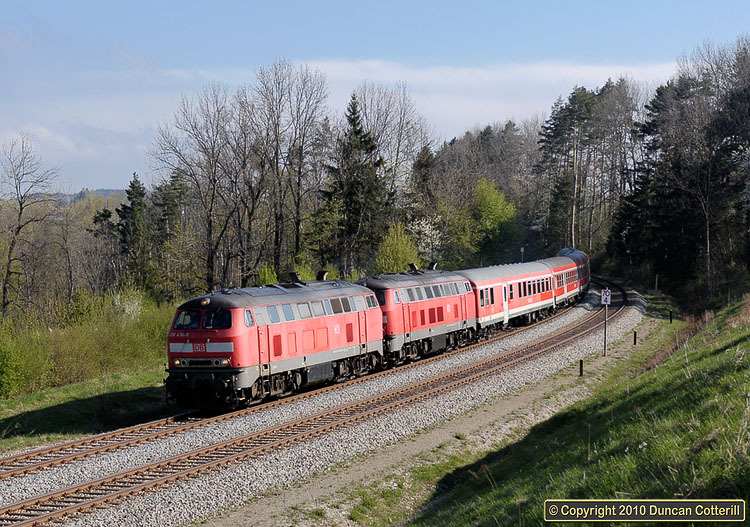 Train RE32647, the 07:58 from Ulm to Oberstdorf was a notable exception and was often double headed to get an engine to Immenstadt to pilot IC2012 northwards later in the morning. On 24 April 2009, 218.434 piloted 218.454 past Kuhnen with the train.